Industry Experts introduced the new market research “Rigid Transparent Plastics – A Global Market Overview“. As per the new report, Asia-Pacific estimated the largest market in 2016 with 13.6 billion pounds while the region is also projected to record the fastest growth during the period 2016-2022. Several producers have been engaged in developing and manufacturing innovative grades of rigid transparent plastics that offer superior performance, such as better light transmittance, strength, stiffness, durability, resistance to yellowing and superior thermal properties. These developments would be of assistance to rigid transparent plastics in capturing more market share, thereby extending their application in a range of industries, including automobiles, building & construction, medical devices, electronics and consumer durables. Worldwide markets for the Rigid Transparent Plastics product types and major end-use sectors are analyzed in this report in terms of volume consumption in million pounds (lbs) for 2014-2022 analysis period. The key regions covered comprise North America, Europe, Asia-Pacific and Rest of World. The global market for Rigid Transparent Plastics is estimated at 25.6 billion pounds in 2016, forecast to be 26.9 billion pounds in 2017, and is projected to reach 34.3 billion pounds by 2022 at a CAGR of 5% between 2016 and 2022. 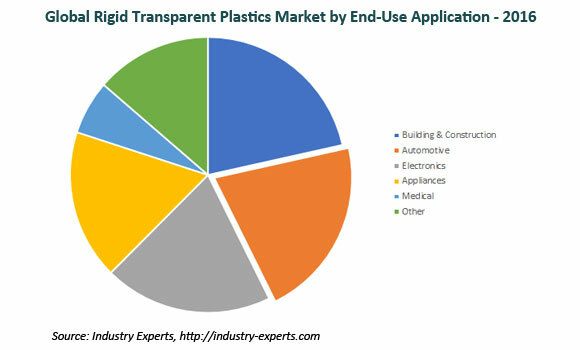 Major end-use sectors of Rigid Transparent Plastics analyzed in this report consist of Building & Construction, Automotive, Electronics, Appliances, Medical and Other sectors. Unique features such as energy saving, ease of installation, recycling, safety, durability and cost effectiveness of rigid transparent plastics enabled the wider acceptance in building & construction industry, the current largest consumer. The prospects of LED lighting market growth put the rigid transparent plastics demand high in electronics while automotive sector is set to be the largest consumer of rigid transparent plastics by 2018 and to sustain till the end of the analysis period. Rigid Transparent Plastics worldwide market is segmented into four major regions namely, North America, Europe, Asia-Pacific and Rest of World. The regional markets further analyzed for 13 independent countries across North America – The United States, Canada and Mexico; Europe – Germany, Italy, France, Spain and the United Kingdom; Asia-Pacific – China, Japan, South Korea, Taiwan and India. The market is analyzed in all of these major regions by key countries, product segments and by major end-use sectors in terms of million pounds. This 232 page global rigid transparent plastics market report includes 124 charts (includes a data table and graphical representation for each chart), supported with meaningful and easy to understand graphical presentation, of market numbers. The report profiles 35 key global players and 37 major players across North America – 16; Europe – 10; Asia-Pacific – 9; and Rest of World – 2. The study also provides the listing of the companies engaged in manufacturing and supply of Rigid Transparent Plastics. The global list of companies covers the address, contact numbers and the website addresses of 52 companies.